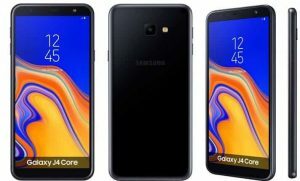 The Samsung Galaxy J4 Core has been released as the company’s second smartphone running Android Go which is also a successor to the first Samsung Galaxy smartphone with Android Go; Samsung Galaxy J2 Core. The new Samsung Galaxy device packs a lot of improvements over its predecessor like the new 19:9 aspect ratio, more battery and more Internal Storage. Let’s find out more. The 6.0-inch device is rocking the somewhat older 18:9 aspect ratio with a 720 x 1480 pixels screen resolution and 274ppi. This is a big step up considering that its predecessor, Samsung Galaxy j2 core has a 5.0-inch screen with 16:9 aspect ratio and a screen resolution of 540 x 960 pixels (220ppi). Back to the Samsung Galaxy J4 Core, it measures at 7.9mm thick and comes in colours Black, Blue and Cooper. There is also a dual SIM slot (Dual Nano SIM) and a dedicated MicroSD card slot. Snapdragon 425 takes the driving seat with Quad-Core processors and a clock speed of 1.4GHz. Adreno 308 is also on board for gaming. The Samsung Galaxy J4 Core has 1GB of RAM just like the J2 Core. However, the internal storage has been bumped up to 16GB here from the 8GB on J2 Core. The storage space can be expanded via the dedicated MicroSD card slot up to 512GB. Booting up is an Android 8.1 Oreo (Go Edition) operating system. The main camera features a single 8MP with f/2.2 aperture and LED flash to brighten those low light photos. The front facing 5MP camera with f/2.2 aperture also has an LED flash also. The battery also saw a major upgrade 3,300mAh from the 2,600mAh on the J2 core. Connectivities available on the device includes 4G LTE, Bluetooth 4.2, Wifi, WiFi direct, WiFi Hotspot, GPS, Micro USB 2.0 and USB On The Go. The device is expected to go on sale this month, November 2018 with a starting price of about $199 or €150.